The Citrus Park boys are into the American Semifinals after ultimately blowing past Shelton Connecticut 8-2 in 7 innings. After a resounding offensive showing against Rapid City, South Dakota, the Citrus Park All-stars have struggled to flex the same offensive muscle, as Hawaii took care of them with a convincing 10-2. They struggled getting runs again against Connecticut, in what proved to be an elimination game. Going into the top half of the 6th inning, CPLL actually trailed 2-1 and were down to their last two outs. 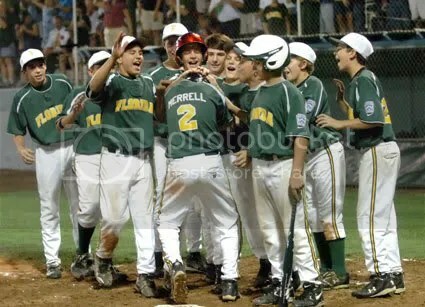 But thanks to a solo home run by Kevin Merrell, the boys were given the opportunity to go to extra innings. 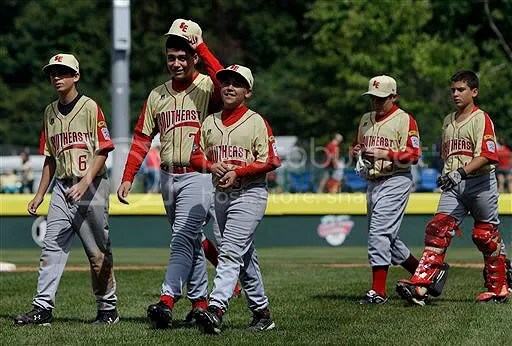 They wasted no time in capitalizing on their new life, as they scored six runs in the top of the seventh, delivering an authoritative challenge to Connecticut, as to say, “Beat us now!” What a display of heart by these youngsters! Their opponent on Thursday is TBD, as the Pool A bracket is wide open! I’ll update tonight with who they play! Tune in at 8pm on Thursday to see if our boys can move on to the US final! The youngsters from Citrus Park opened up the 2008 Little League World Series in grand fashion this afternoon, as they clobbered the Midwest representative Rapid City, South Dakota 10 – 0 in a “10 run rule” shortened game in four innings. The runs came early and often in an 8 run 1st inning as the Southeast reps sent 12 boys to the plate. They tacked on 2 more runs in the second. The combined pitching efforts of Levi Gilcrease, Darren Miller, and Kevin Merrell combined for a four inning no hitter. The offensive outburst, dependable defense, and stellar pitching has perhaps placed a target on the boys from Tampa as the team to beat. Good job and good luck! CPLL continues Pool B play against Hawaii on Sunday night at 8 pm. Make sure you watch, heapsters! A heartfelt congratulations to the Citrus Park Little League All-Stars as they have won the Southeast Regional Championship and have earned a spot in the Little League World Series tournament to be played in South Williamsport, Pennsylvania. It is the first time since 1991 that the Tampa Bay area has had a representative in the finals. CPLL will actually kick off Championship play for the tournament playing at 2 pm on August 15 against the Midwest representative, Rapid City, South Dakota. Ten bucks that this is probably the most exciting thing to happen to South Dakota in a long, long time. We’ll keep you posted on the tournament and what goes on with our Tampa boys! Good Luck! For the Tampa Tribune article, click here. Emphasis on dreams and memories, rather than the pressure to win it all. I like it. Back in my younger days, yours truly was elected to his local little league all-star team! 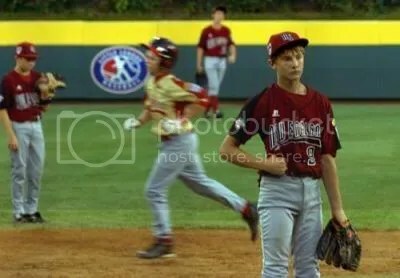 Unfortunately, Northeast Little League (Which has been renamed New Tampa LL… *tear*) came up about 20 games short. I did look good in pinstripes though (they are slimming) and knee socks (which should be mandatory in all professional levels of baseball) but I digress. Hopefully CPLL can pull it off!